I am forever humbled by the ability of those in academia to engage in and inspire catfights that rival some of the verbal battles I observed tutoring elementary school children last year. 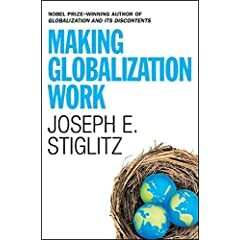 Few bring it out worse than Joseph Stiglitz, who recently released his new book Making Globalization Work, the follow-up to his fiery denunciation of the Washington Consensus brand of economic liberalization in Globalization and its Discontents. Stephen Kotkin of the NY Times wins the award for bad kitty scratch: ?If a prize in politics were awarded for self-righteousness, Joseph E. Stiglitz, despite stiff competition, might be near the top of the list.? The Economist jumps into the fray, criticizing Stiglitz for having solid writing but offering vague and unexplained solutions.I, for one, enjoyed Stiglitz’s last book and I made a point of attending his lecture as a freshman when he came to speak at GWU; although if he is reading this I want to clarify that I fell asleep because of exhaustion after an all-nighter studying econ, not because of his delivery. See his recent Guardian article for a preview of his latest, it should be an interesting, if controversial read. Perhaps less exciting, but more substantive, Brookings released a report on the role of the private sector in development. This is a roundup of several papers the institute had previously released surrounding a conference exploring various angles of enterprise in development. Having checked out several of the papers, I can say that from what I have seen, this work goes beyond the standard platitudes and sweeping statements about how innovative private sector solutions can reach the underserved, etc, etc, etc and actually discusses real proposals for initiatives that can be taken by governments and financial institutions to make lasting impacts. The downside is that these papers, unlike Stiglitz’s work, aren?t flamboyant enough to inspire the kind of vitriolic responses that bloggers like myself love to write about? I might have to wait for the next Sachs book.